On 5th July 2005, the CEO of Sydney Airport Corporation Limited (SACL), Max Moore-Wilton, sent a note to AFP Commissioner Michael Keelty and Justice & Customs Minister Christopher Ellison informing them that Schapelle Corby’s boogie-board bag was the only one not scanned for the flight to Bali. In other words, that it had been diverted around the scanning system at Sydney Airport, which clearly indicated that it had been tampered with. Prime Minister John Howard was informed by Michael Keelty shortly thereafter. However, instead of providing this vital evidence to Schapelle Corby, her legal team, or the Bali court, all four men withheld it. 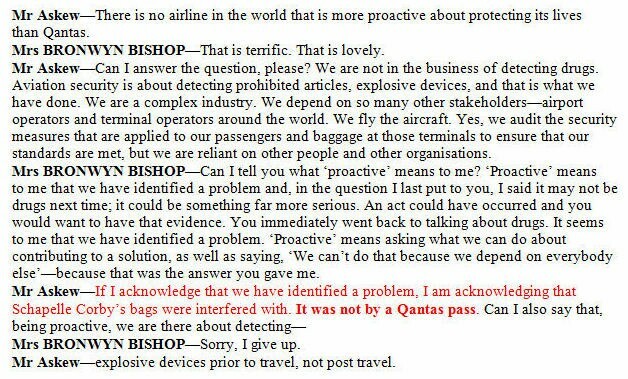 Under pressure from Bronwyn Bishop MP , and apparently anxious to pass the buck, Askew volunteered rather more than was expected: that the ‘problem’ referred to “was not by a Qantas pass”. In other words, it was perpetrated by someone who was not a Qantas employee or agent (i.e. someone who was not wearing a Qantas pass/badge). This statement of fact directly confirms the prior comment, that Schapelle Corby’s bags were interfered with, but places responsibility outside the remit of his own employer. In her overall frustration with Askew’s corporate wriggling, Mrs Bishop didn’t explore or press this issue further. However, Askew’s statement not only points the finger squarely at SACL, but indicates that he too was personally aware that Schapelle Corby’s bag was tampered with and that this was perpetrated by SACL’s baggage handlers. Regrettably, this remarkable exchange, including a public admission by a relevant authority that Schapelle Corby’s luggage was tampered with, was never reported by the media, and the revelations were never pursued or investigated further. 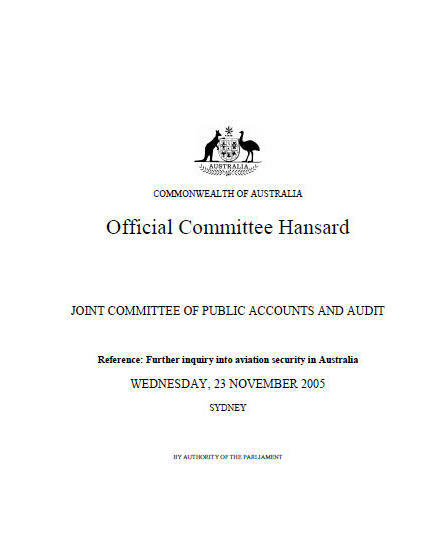 The same applies to the many other examples of the withholding of central primary evidence by Australian based parties. Schapelle Corby, her lawyers, and the Bali court, were repeatedly deprived of the material evidence which would have forced an acquittal. Given Mr Askew's propensity to deflect all responsibility from Qantas, it is worth citing an incident which most definitely did occur on "a Qantas pass". Schapelle Corby checked her bags in underweight, but they were subsequently found to be 5kg overweight on the Qantas system (which would have carried an excess charge of $175). This clearly indicated the addition of a significant weight factor, after the bags had left her hands. This is confirmed via their own submissions and correspondence. As above, neither Schapelle Corby, her legal team, or the Bali court, were ever informed.